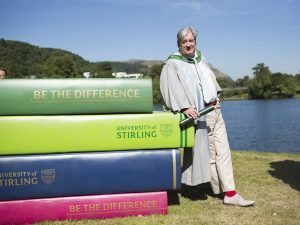 On a sunny afternoon in June the University Of Stirling presented the writer Patrick McGrath with an honorary degree in recognition of his outstanding support for research and learning at Stirling. In 2015 Patrick deposited his literary papers with the University Archives, a fantastic resource for researchers of contemporary fiction, and in particular the students of the university’s MLitt course on The Gothic Imagination. The University Archives was delighted to welcome Patrick on the morning of his graduation and show him how his papers are being cared for at the university, the visit captured in this lovely video. It is an honour to introduce Patrick McGrath today, a critically acclaimed novelist whose work consistently stages and interrogates both psychopathology and psychiatry. His novels include The Grotesque, Spider and Asylum. His most recent novel The Wardrobe Mistress was published last year. Patrick grew up in the grounds of Broadmoor Hospital where his father was the medical superintendent. Well-versed in theories of psychiatry and psychoanalysis Patrick’s works are often narrated by psychiatrists, or those suffering from mental ill health themselves. He is a writer who is fascinated by the human mind and by those spaces where both trauma and healing may take place such as the institutionalized asylum, the analyst’s office, or even the family home. In 2015 Patrick deposited his literary archive with the University of Stirling Archives. The University runs a highly regarded MLitt course on ‘The Gothic Imagination’ which teaches his work and Patrick was keen for his archive to go to an institution where the material would be of direct benefit to academics and students. 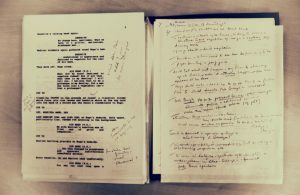 The archive provides a comprehensive record of the author’s creative process from rough writing notebooks, to early drafts of novels, to proofs and published editions and on through promotional material, press cuttings of reviews, correspondence with publishers and material relating to film adaptations of his work. The collection will continue to grow as Patrick is committed to continuing his relationship with the University of Stirling. Indeed the manuscripts and drafts of his most recent novel have already been transferred to the archive. The deposit by Patrick of his literary archive with the University is an act of great generosity and commitment to academic research. In doing so Patrick has chosen to support a university which teaches Gothic fiction – the critical field in which his work is often read and considered – at both undergraduate and postgraduate levels. Over the last few years our students have gained a unique opportunity to work with the archives of a contemporary writer. They have assisted the archives team in the sorting, arrangement and cataloguing of the collection, with a number of students going on to use the archive as the subject of their academic research. Throughout this process the University Archives has benefited from Patrick’s continued support and engagement, creating a stimulating research environment for everyone involved in the project. This award of an Honorary Degree recognises Patrick’s support for the inclusive and ambitious academic aims of the University of Stirling. He is a writer whose outlook particularly suits Stirling’s principles and goals as he strives endlessly to understand the human mind and the human condition. This is evident in his many meditations upon Broadmoor Hospital in London, this work complementing our NHS Forth Valley Archive which includes the historical records of a number of local institutions including the old Stirling District Asylum. Patrick’s work is of global importance, as can be seen in the international editions of his work which have been translated into many languages present in the collection, and his standing amongst contemporary critics of Gothic literature is of the very highest calibre. Patrick’s mother Helen dreamed of opening a bookshop in Stirling. While she never fulfilled this dream I am delighted that we have welcomed her son to the city to formally recognise his most generous gift to the university. In the name and by the authority of the Academic Council, I present to you for the Honorary Degree of Doctor of the University, Patrick McGrath. 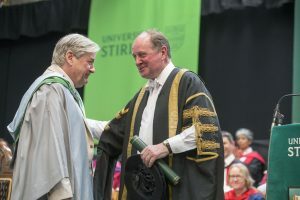 Patrick McGrath being awarded his Honorary Degree by James Naughtie, Chancellor of the University of Stirling. Pages from the Patrick McGrath Archive, University of Stirling.